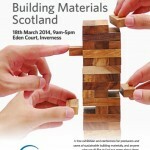 Professor Sue Roaf will be giving a presentation on low-carbon buildings and how to account for them at the Sustainable Building Materials Scotland conference. It will take place on 18 March 2014 at the beautiful Eden Court Centre, Inverness. Booking is not required and the event is free and open to all. Find our more on the ICARB events pages here. This entry was posted in Carbon News, Top news on February 7, 2014 by Ric.